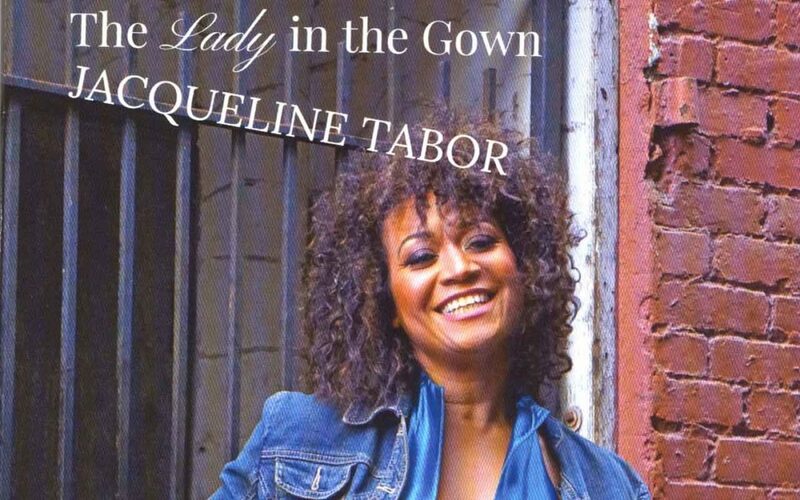 Northwest vocalist Jacqueline Tabor’s newest CD release, Lady in the Gown, is a pleasurable combination of grace, energy, and emotion. With confidence and a pleasing balance of somberness and sauciness, Tabor entertains us with her take on numerous jazz standard classics. She renders such classics as “On Green Dolphin Street,” popularized by Miles Davis, in a dulcet, melt-in-your-ears manner. While Billie Holiday took the song “I Can’t Give You Anything But Love” and made it downtempo, slow and searing, Tabor makes the song her own and transforms it into a buoyant up-tempo piece backed up with a very self-assured bass. Tabor is supported and complemented well by Greg Feingold on bass, Max Holmberg on drums, and Cole Schuster on guitar, a unit known as the 200 Trio. Tabor takes the same tack with “Autumn Leaves,” leaving behind the sad, slow renditions popularized by such artists as Nat King Cole and Chet Baker; instead, Tabor gives us a livelier piece with hints of wistfulness and ends on a satisfying and heartfelt high note. “Autumn Leaves,” along with other songs including “Tight,” “When Lights Are Low,” and “I Fall in Love Too Easily,” showcase Tabor’s talents but also allow the instrumentalists to shine through. Tabor’s surprise is her own composition, the namesake of the CD, “Lady in the Gown.” Relating a jazz singer’s life, this song is jammed with an upbeat spirit of confidence. Tabor lets us know with pluck and humor that she “loves her music just like her man” and that she “rocks it like a queen that’s proud.” Tabor’s love of life and love of music sparkles and beckons through all her songs. Jazz fusion has made a comeback. Though, as any major dude will tell you, it never left. The vanguard of today’s fusion, artists like Thundercat and Snarky Puppy, continue to meld the philosophy of jazz in the instrumentation and attitude of rock and funk. Rather than brashly rehash the past, however, today’s fusionists channel its golden era self-consciously, rescripting the optimistic ideals of another time for our own. Seattle’s fusion big band High Pulp’s debut, Bad Juice, embodies some of the best qualities of this new-old wave. The group, founded in a Greenwood basement in 2015, answers the new millennium’s post-trip-hop, -indie, -ambient, -drum & bass, etc. contemporary with vinyl sharp grooves, macramé arrangements, and session-level instrumentation. Having honed their dynamic in regular gigs at The Royal Room and festivals including Upstream, High Pulp were playing on the record even before they had one. Rob Homan and Antoine Martel (keyboards), along with Gehrig Uhles (guitar), honor the hallucinogenic atmosphere of Miles’ electric era on surfy cuts like “Dave’s,” and a wah-wah get down worthy of John Shaft on “Ezell’s,” a cool hallelujah, no doubt, to Seattle’s esteemed fine dining institution, Ezell’s Fried Chicken. Like a secret recipe, High Pulp’s sound, as good music must, transcends its ingredients. While a track like “Impression” starts in ambience, dub-style drums, and praying keyboards, it suddenly jumps from the reverb-heavy reflections of the horn section, with sample-like shouts to a fast-tracked beat begging for rhymes. The form is asymmetric, but the effect is magic: what’s old becomes new again. Let’s not forget her supporting actors. Clement, who provides her own songwriter’s croon to backing vocals, commands acoustic and electric keyboards with her finely serpentine textures, captivating with Brubeckian orchestral flourishes on “The Very Thought of You.” Symer’s solo sings on “Secrets,” but the bassist really cruises with the unhesitatingly hip Lewis. The pair re–stitches rhythms in a funky retwinning of “I’ve Got No Strings,” shifting the rhythmic emphasis onto the three while Clement’s chords jump giant steps. “How I love my liberty/there are no strings on me,” Kendrick sings knowingly on the same track. If jazz means freedom, then listeners could learn a thing or two about liberation from Kendrick, whose style only shines brighter the darker her music gets. More than Romeo and Juliet, the musicians on Flying stage for us nothing less than life, liberty, and the pursuit of happiness. If music be the food of love, play on!